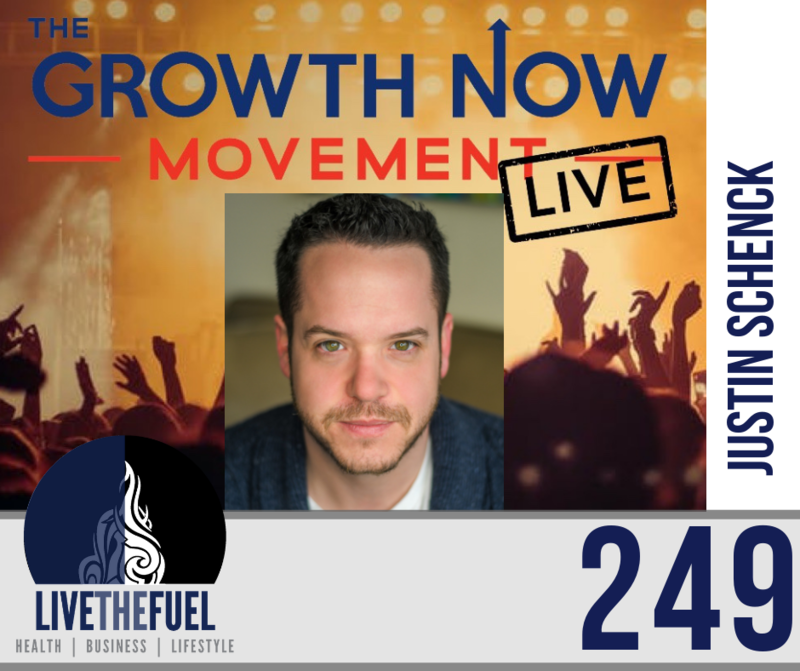 Attend the Growth Now Movement LIVE and Grow Your Podcast with our co-host, Justin Schenck! Justin has been named a Top 8 Podcaster to watch in 2018 by INC.com and chosen as an ‘Icon of Influence’ in the new media space. What started out as a way to connect with top people and inspire others has become a way of life. Now getting played in over 100 countries every single week he is able to make a greater impact than he could ever imagine. He not only speaks to organizations on how to overcome adversity and utilize podcasting to grow your business but he helps others launch and grow their own podcasts with BeginPodcastingNow.com. Life is 10% what happens to you and 90% of how you react to it. 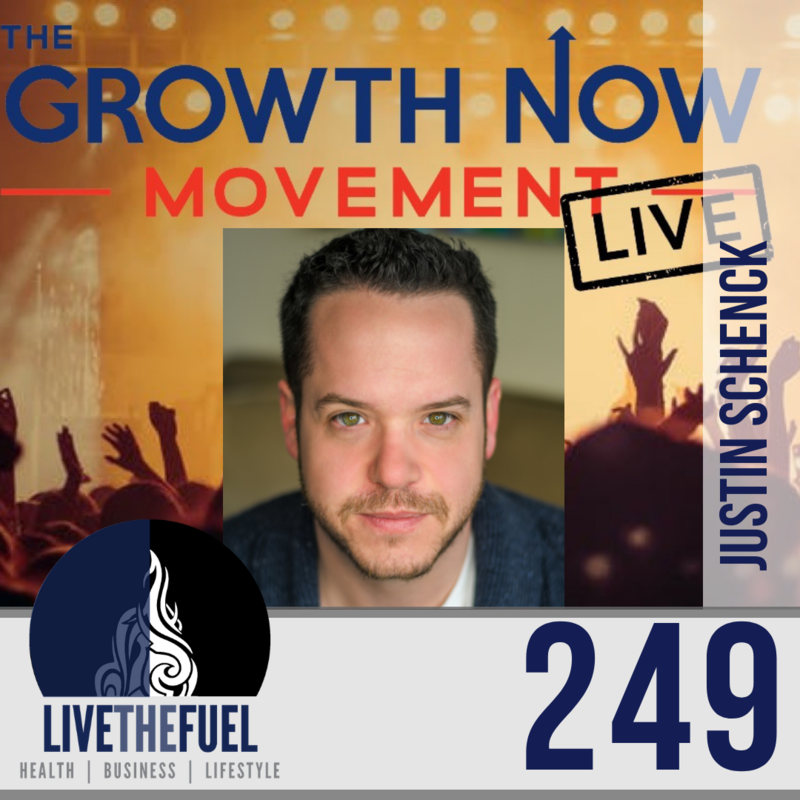 ‘Leveling Up in All Areas of Your Life’ with host: Justin Schenck and some of the worlds top performers in the business, health, and relationship domains. Justin Schenck has been named a Top 8 Podcaster to watch in 2018 by INC.com and chosen as an ‘Icon of Influence’ in the new media space. What started out as a way to connect with top people and inspire others has become a way of life. Now getting played in over 100 countries every single week he is able to make a greater impact than he could ever imagine. He not only speaks to organizations on how to overcome adversity and utilize podcasting to grow your business but he helps others. Be Yourself and Increase Transparency. Attend the Growth Now Movement LIVE event. First of all, I appreciate you having me on your show. To everybody listening, the reality is this, wherever you are in life right now, that’s exactly where you’re supposed to be. I think sometimes we often think we were supposed to be something different than we are. But we’re not. You are exactly who you’re supposed to be. You’re exactly where you’re supposed to be. If you want to make the future better, you have to make choices to get better, right? You have to take that first step towards growth, you have to take that first step towards the goal because you’re not going to get that goal overnight! All that matters is really the journey and so what I say to everybody is it doesn’t matter where you come from, and it doesn’t even matter where you are right now, what matters are the decisions you’re making today to move forward. Whether that’s going to live events, as we talked about, whether that’s listening to this podcast. Whatever it is, you’re making the right choice right now. So step forward into the person you’re supposed to be! [06:00] I knew I was just gonna throw myself to the wolves. I kind of do that to myself all the time. I started podcasting two and a half years ago and I had no idea what I was doing. I didn’t do the proper amount of research. [10:00] I might do a little bit more of that, like bringing people on to actually coach me because I’m very very coachable. I’m willing to learn and get better and I know I’m not the best. [14:30] I tell everybody that comes to me and says, I want to start a show, so I ask them why. I want to grow an audience in Melbourne, for example. The first thing we need to realize is that 80% of these shows are doing less than 100 downloads an episode and that’s okay. [20:00] There are events out west that you could buy a ticket and get refunded when you get there like it’s a reward to show up but if you don’t show up, you don’t your money back. I also know when companies do that they’re going to then sell me something else. The cool part about my event is I’m not selling anything from the stage. It’s literally come in and you’ll make a big impact on your life. There are celebrity speakers like Fabio Viviani and Sarah Centrella. I feel blessed with the relationships that I’ve built that I can now give what I’ve been able to do over the last two and a half years to other people and make those connections. [25:00] Just because you speak on stages, doesn’t mean you can’t learn from the other people speaking on stages. I speak all over the country, it’s usually on podcasting, relationship building, or whatever. I go to more events than probably most people. What I do differently is actually take action afterward. [30:00] Justin Kavanaugh is the business consultant and coach. The guy is known as a top-five speed and performance coach in the country. He trains guys to get ready for the NFL combine, top-five like that. [35:45] This is what I say about Lewis Howes. He is the master of branding. His live event is what I’m modeling after because I really believe in finding the master or you find a master to follow their model. His LIVE event is bonkers, it’s an amazing event it’s game-changing. I’ve been there every year, he’s high energy and it’s high energy. Dude I watched him, if you want to talk about the business side of things, last year make $200,000 in an hour because he sold 1000 tickets for $200 each, live on stage within 20 minutes. [41:00] Top five things to grow your audience. I think number two on the list is you have to get in front of podcasters. You do that by getting on shows and getting in front of the right audience. [46:30] Even before Top Chef, Fabio became a millionaire and lost it all. Then he was building as well again. If you’re a legit millionaire, that means you have legit meaning, you actually have a good head on your shoulders. You can always make it back. [52:44] A question I get all the time and I don’t alway’s get the opportunity to ask other people, is where do you see podcasts going? [01:11:00] That’s why I’m holding my event in Reading, PA, just like my podcast is live, it gets played everywhere. I can have it in Philly or I can have it in New York City and sell more tickets doing that. However, I’m holding it in Reading because I want to make an impact here in Reading for the city.